Has ‘Share a Coke’ Gone Flat? Last year’s successful ‘Share a Coke’ campaign saw Coca-Cola replace its iconic branding with some of the most popular names in the UK. This year, the campaign is back with more names and an advertisement starring Bobby the dog in search of his own personalised bottle. But has the campaign reached the heights of last summer? Coca-Cola has also introduced nicknames including ‘Mum’, ‘Dad’, ‘Bestie’ and ‘Mate’ in their multi-pack 500ml cans in a bid to encourage friends and families to have a coke whilst at social gatherings this summer, in order to differentiate from last summer’s effort. Using YouGov’s brand perception tool, BrandIndex, we can see whether this year’s ‘Share a Coke’ campaign has been able to replicate its success in summer 2013 for both Coca-Cola and Diet Coke brands. Our Ad Awareness measurements assesses whether respondents have seen a brand’s advert over the previous two weeks. By analysing our data, we can see that during the 2013 campaign (from 1 May 2013 to 31 September 2013), the average ad score for Coca-Cola was 22.1, which is close to this year’s average score (21.6) since the campaign began on 2 June. However, scores went as high as 27.3 on 19 June 2013 while the Ad Awareness has only peaked at 23.8. Also, last year’s average score for Diet Coke (10.4) was almost equal to this year (10.0). While the average of last year’s Ad Awareness score mirrors this year’s campaign thus far, we’d expect the Buzz (that measures whether consumers have heard anything positive or negative about the brand over the previous two weeks) and Recommend (which asks respondents: "Would you recommend the brand to a friend or colleague or tell a friend or colleague to avoid the brand?") to have similar average scores. Coca-Cola’s Buzz score in 2013 started with a score of 0.1 and had an average score of 1.2, peaking at 5.4 on 23 June 2013. 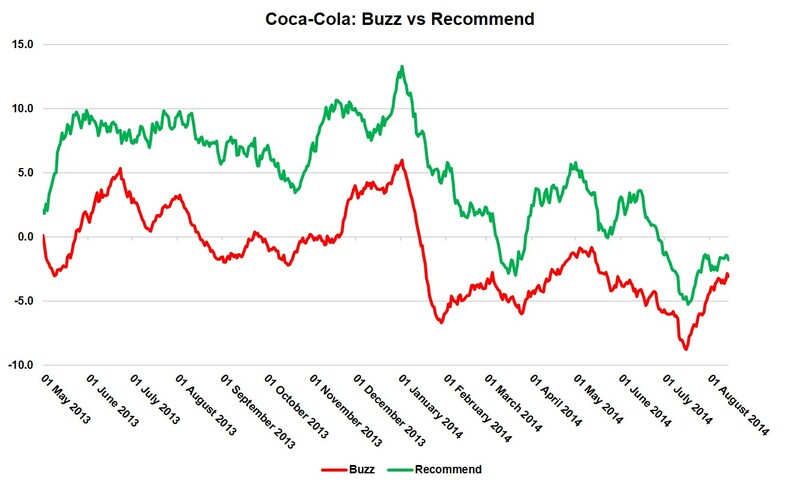 However, since the beginning of 2014, Coca-Cola’s Buzz Score has consistently been negative and has failed to rise above zero since the campaign began, scoring -5.7 on average. However, since the launch of their TV ad on 17 July, the scores gradually rose from -8.4 to -3.1 on 14 July. 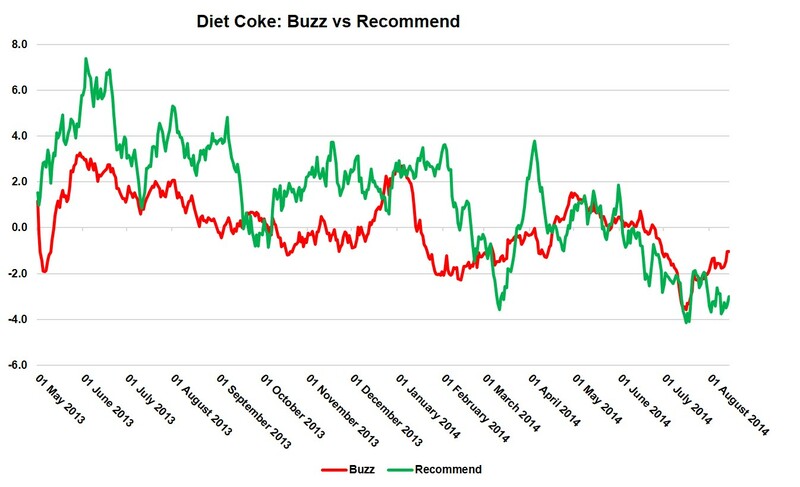 The Diet Coke Buzz metric has shown a similar pattern to Coca Cola’s; it had an average score of 1.35 in 2013 and -1.20 in 2014. The concept of the ‘Share a Coke’ scheme is to bring friends and family together during social event over the summer. Have people been sharing the news about the personalised Coke’s comeback? Their Recommend score in 2013 started at 2.1 and ended up with an average score of 7.9 until the end of the scheme. However, we see a different pattern this year. Its score dropped from 3.6 on 15 June to -5.0 on 19 July, averaging at -0.9. 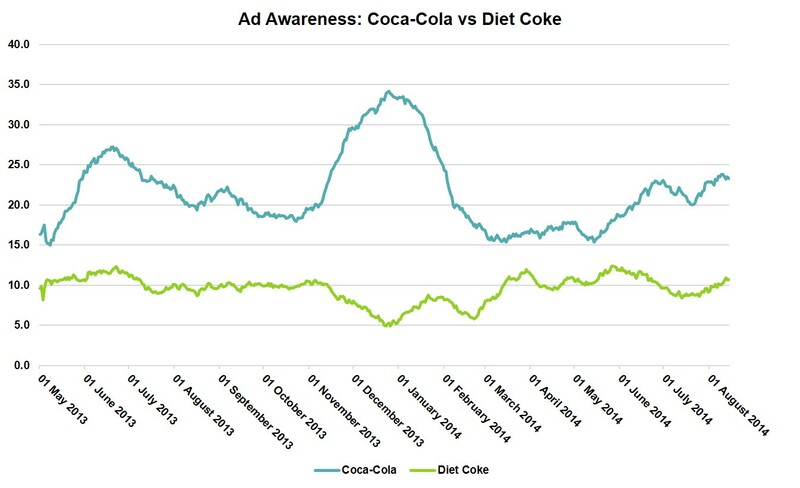 Similarly, Diet Coke averaged at 7.9 in 2013’s campaign but figures dropped to -0.9 since 14 June. Although more efforts have been made to make Coca-Cola’s scheme bigger and better than previous ones, YouGov’s BrandIndex tool indicates that consumers may no longer be excited about searching for their personalised Coke bottles. It will be interesting to see whether the brand takes a different approach next summer in order to captivate consumers in the same way their initial campaign did.